Two fall foods, pumpkin and cherries, come together for these seasonal snacks. 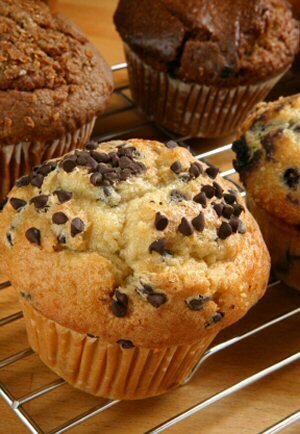 These sweet, moist muffins are ideal for breakfast, a middays snack, or a light dessert. 1) Preheat oven to 400°F. Grease and flour a muffin pan. 2) In a large bowl, combine sugar, oil, and eggs. Add pumpkin, juice, and vanilla; whisk well. In a separate large bowl, mix together flour, baking powder, baking soda, cinnamon, cloves, and salt. Add egg mixture and mix well. Stir in cherries. 3) Fill muffin cups 2/3 full with batter. Bake 20 to 25 minutes, until a toothpick inserted in the middle comes out clean.